A Google Shopping Ad is an ad at the top of the Google SERP featuring specific products that you sell. This type of ad shows up when someone searches for your product, and includes an image, a product title, a price, and a brand or website name. These particular ads allow people the chance to compare products visually before clicking into any websites. Google Shopping Ads are a great option for product-based ecommerce businesses. 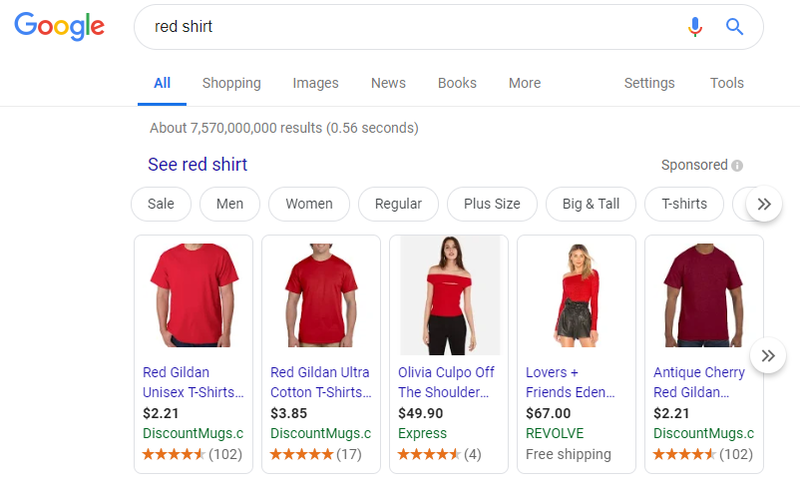 They work similar to Search Ads; however, in Google Shopping, Google automatically targets your products to relevant searches, rather than targeting specific keywords. You can set bids at the product group level, and you can narrow targeting by organizing products into various groups. Shopping Ads can refer to product ads featuring a single product, or Showcase Shopping Ads, which showcase several related products. Shopping feeds are set up in Google Merchant Center, which contain details that Google uses to match your ad to a user’s search. Once your products are uploaded into Merchant Center, a Shopping campaign is then created in Google Ads, where you will see your products, manage bidding, and view industry benchmarks and your overall performance. There are 3 types of Shopping Ads available. Product Shopping Ad: This is a single ad representing a single product based on the product data submitted to the Merchant Center. Showcase Shopping Ad: This is an ad created in Google Ads that shows a group of related products. Users can compare several of your products and click the one they’re interested in. Local Catalog Ad: This is an ad type on the Google Display Network meant to drive traffic to your local store. Depending on what type of ad you choose, Shopping Ads can be shown across the web, including on Google Shopping, Google Search (next to search results and separate from text ads), Google Search Partner websites like YouTube and Image Search, or the Google Display Network.